There are certain parts of the city that just find themselves being the centers of diversity. One way to find them is to begin searching out ethnic restaurants. In our Latin eating adventures we are affectionately calling the Latin Tongue series, we have definitely noticed a clustering effect for these south of the border entrepreneurs. Examples of this are Bloomington and Lake street and parts of Nicollet avenue in Minneapolis, the district del sol in St. Paul, and also Dayton's bluff. This week, we traveled back to yet another Latin hotspot, Central avenue in NE Mpls, for our third time. We started with El Taco Riendo, still one of our best experiences; this time, we went back for a place that had not been on our radar when we started, Maya Cuisine. As a matter of fact, they have only been in business for just over three months and their Facebook page says that they have already entered the top ten for best Taquerias in the Twin Cities. Sounds like we'd better get on the bandwagon before it's full. If you know anything about this place (and we sure didn't when we walked through the door) it would probably be about their homemade tortillas and the vast selection of handmade tamales. But it was fun to enter Maya completely clueless about these two things. It made the discovery that much more exciting. We had to ask questions and get the real scoop, instead of just taking what has been said by reviewers and trusting blindly (Ironic that we are now writing a review...so I suppose you should just stop reading and go eat tacos). Upon entering, we were immediately impressed by the unique selection and how personalized it seemed to this specific establishment. This was no cookie cutter Latin experience based upon a study of American eating or something churned out by a marketing department. As we spoke with Isella and Victor, the husband and wife team behind Maya Cuisine, one thing became obvious. This was their food! They were not shy about the fact that they only put things on the menu that they like and recipes that they truly believe in. They also are not afraid to push boundaries (think barbacoa tamales or the pineapple, coconut and raisin tamal) and if something doesn't work, it goes away. Another example of their own tastes showing up is the spice. Victor likes it hot and he was excited to share three different habanero salsas with us. Isella, not so much, hence the raja tamal with a poblano pepper. Ask her about her hubby's salsa and you'll get a wry face that doesn't want to understand an obsession with heat and pain. It's a nice balance if you ask me. Ok, enough already, let's get to the food. 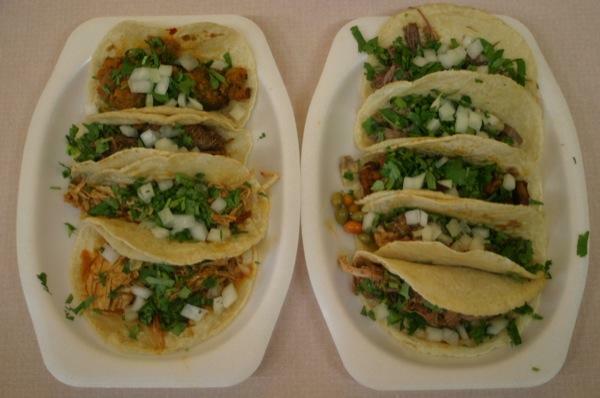 To put it bluntly, we were overwhelmed…and we were only looking at the tacos and tamales. So, we did what any normal person in this situation would do and ordered one of everything. Fine, we did decide to have a bit of restraint and left off three tacos and two tamales, meaning that we ended up with 8 tamales, 10 tacos and 6 salsas. I get giddy just thinking about it. Isella also insisted that we accompany our meal with a sampling of beverages, so we tried the 4 flavored waters (horchata, cantaloupe, hibiscus and pineapple) and 2 hot drinks. Wow! I'm not sure how to even begin to discuss such a bounty. I think a couple of words in general about the tacos and tamales and then we will focus on the fillings. As for the tacos, it doesn't really get any better A trio of salsa next to the chipotle chicken tacothan fresh tortillas. They were small, supple and steamy and really made a better taco. The salsas were the final piece that put these tacos over the edge. They have a number of salsas available at their salsa bar and we found a few to try. Besides the standard fresh green and red salsas, they had two that really stood out. First was a deeply rich and smoky salsa that was not overly hot. It was a combination of pasilla, arbol and guajillo chiles and was totally unique to me. The other standout was their arbol chile salsa. 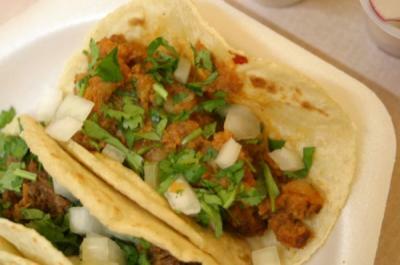 It is more common and you might recognize it as the yellow/orange salsa with red flakes present at many taquerias. Theirs is among the best, creamy, spicy, sweet and tart. As mentioned above, if you are feeling adventurous, ask about their habenero selection. It is searingly hot as to be expected, but delicious as well. The tamales are all handmade and there are about a dozen to choose from. Compared to most Latin eateries that offer two or three at most, this is just downright unusual and anything but traditional. The savory options include the more typical pork and chicken selections, but also meats like barbacoa, a A mess of hot and steamy tamalesveracruzana style with chicken, adobo and banana leaf, a "raja" style but with poblanos instead of jalapeños and not one, but two veggie options. 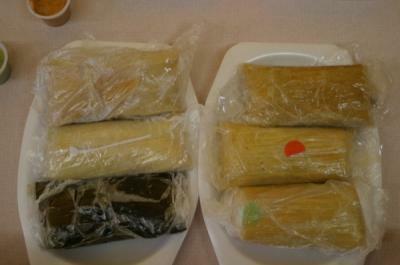 They also offer two sweet options that were in production when we were there and not available, a pineapple, coconut and raisin tamal and a strawberry and peach tamal. The "style" of these tamales were what I would call wet. They are made fresh and wrapped in the typical corn husk or banana leaf and then wrapped in plastic until you, the lucky consumer, open them up. This is fairly common in many places whether you know it or not, as they often take the plastic off for you. 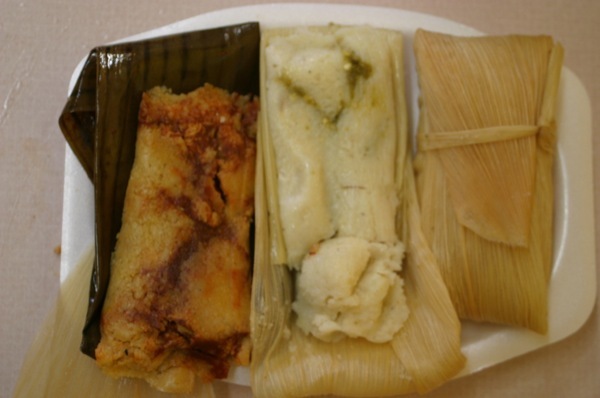 The end result is that when you unwrap your tamal, you are left with a steamy, moist treat. It is definitely a bit more messy, but to me worth it. I am not a fan of dried out tamales and if I have to eat mine with a fork, so be it. The masa was light in color and very sweet, with little to no added spice and plenty of good corn flavor. Ok, at this point you have probably turned off your computer and rushed off to Central Ave. If you are still with us, let's talk about the meats and veggies! We were most excited about the barbacoa, cochinita pibil, and the chipotle chicken. The barbacoa was absolutely outstanding. It had that amazing spice of good barbacoa grounded with guajillo chiles. It was obvious from the start that this was one of their signature meats. Think flavors of beef, raisins, clove, guajillo, and smoke and you begin to understand. Put it on a freshly homemade tortilla and add a bit of their homemade smoky salsa mentioned above and you have found something worth searching for. Want more, it comes in tamale form. We were absolutely blown away by this. It was so simple, but genius. You take that smoke and meat and balance it with sweet, creamy masa corn. Sold! Cochinita pibil is a marinated and shredded pork that you find on a rare occasion and in the south of Mexico it is traditionally served with habanero and pickled red onions. It is outstanding, but we have only found it once in the Twin Cities, at La Mixteca in Bloomington. Now, here it was again. Although, they did not have the pickled onions, they offered us some special mini habeneros with it and we were in spicy pork heaven. The meat is subtly spiced, rich, juicy and tender. It is a must try in my opinion, especially with their selection of habenero salsas. The chipotle chicken (pictured above with the salsas) was one of the surprises of the trip. As a matter of fact, all of the chicken was. 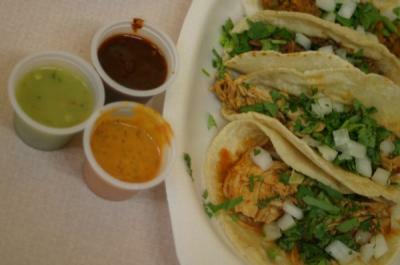 So often, chicken is one of the so-so selections at Latin eateries. Kind of an also-ran after the pork and beef options. At Maya Cuisine, they have something special going on with their chicken. It is perfectly moist and savory with just a hint of smoke. I kept coming back to it and bite after bite, I was convinced it was one of their strongest options. When you add the chipotle flavor to it, you are left with an outstanding meat for a taco and I imagine a guisado plate or a burrito as well. The chipotle chicken was definitely one of the highlights of the trip. Other meats of note were the cabeza and the chorizo. The cabeza was not your typical "head" meat. Usually, it is full of the fat from the cheek area, but Victor gets really picky here. He told us that he doesn't The chorizo taco like all of that fat in there and trims it off, leaving the rich and deliciously lean meat of the cheek and jowls. It was so different in fact that we were confused about what it was. "Did we order the shredded beef?" I guess we did when we said "cabeza por favor". It was really tasty. The chorizo also stood out as they once again had their own take, which I'm not sure everyone would like. It was chorizo all right, but mixed with "mashed" potatoes and some grilled peppers. The end result was like spiked mashed potatoes. It was amazingly flavorful and somehow really balanced the normally strong, lingering flavors of the chorizo. I'm curious to try it again, possibly on a torta or in a burrito. -Spinach, mushroom and cheese: Not really like a tamal at all. More similar to polenta and veggies with a Spinach, mushroom and cheese tamal w/sour cream mozzarella-like melty cheese. So easy to eat! -Raja: The choice to use a poblano pepper instead of jalapeños makes this almost too easy. It comes stuffed with a chewy Mexican cheese that goes with roasted peppers very well. I ate this one the fastest. 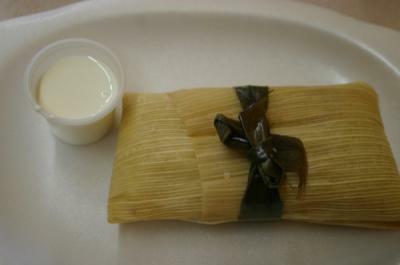 -Veracruzana: I love banana leaf tamales. It adds such a nice flavor to the masa corn and when you have excellent chicken and a great adobo sauce like Maya Cuisine does, it is the perfect storm. -Pollo verde: Amazing chicken, great salsa verde. Their most popular tamal. -Veggie: Just simple and delicious. Packed with corn, green beans, carrots and peppers. Great for taking on plenty of salsa. In summary, this place was that perfect combination of extremely welcoming and friendly folks, handmade and well-prepared foods and good value. The only thing that would have made it better for us would have been some real plates and dishes. It is hard for us to see all of the styrofoam and garbage. As for the food and our recommendations, it really is not something you can take in all in one trip. Sure, we might have tried almost every taco and tamal on the menu, but we didn't even get into other realms, like soup, tortas and burritos, not to mention the fact that they serve breakfast and are constantly working on new items. So, dear reader, this is where we need your help. Been there? Tell us your experience. Haven't been yet? Well, get your Latin tongue up there and try something and report back to us….and say hi to Isella and Victor for us. In the meantime, when we go back, perhaps it will inspire a part two?? Hours: 7am-9pm, 7 days a week. Surprise: Really, just about everything was a pleasant surprise. The vast tamale menu was the first thing that got our attention. The enthusiastic service was amazing. The final and big surprise was the discovery that they are open for breakfast and the accompanying hot beverage tasting that Isella insisted on. We were told that they themselves often have a tamale and hot beverage (not coffee) for breakfast. They offered us two items: champurrado and an atole de arroz. The champurrado was outstanding. A sort of hot chocolate with a definite presence of rice and/or corn. The hot rice drink was basically like hot horchata, but with actual rice in the drink. So perhaps it fell somewhere between horchata and rice pudding. Fascinating. Payment: Cash or credit, but help out this new business by paying cash. Language: Bilingual for sure. Easy to communicate here. Lawrence Black is a writer and editor at Simple, Good and Tasty. He can be reached at lawrence@simplegoodandtasty.com. Beware of his crazy eyes as they search for the next great Latin eatery as well as his almost constant onion breath. Peee-ew. 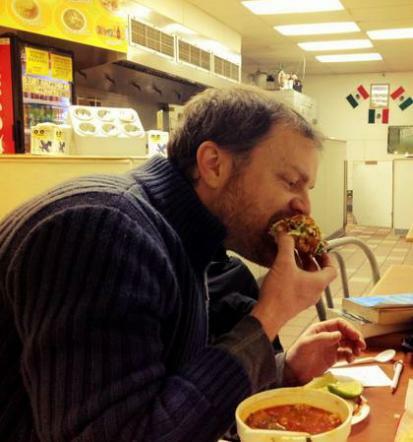 Our last Latin Tongue review was: Gorditas El Gordo.